Ridgeview Park is family owned and operated by Phil and Fiona Sloane having over 20 years experience in the thoroughbred industry. We provide a high quality personalised service for your broodmare, weanling, yearling or racehorse. Agistment: 350 acres of pasture improved paddocks with horse safe fencing and tree sheltered laneways. We provide long term and short term agistment which includes quality hard feeds and lucerne hay daily. We will also cater for our clients individual requirements. Also provided are safe and secure racehorse spelling paddocks. 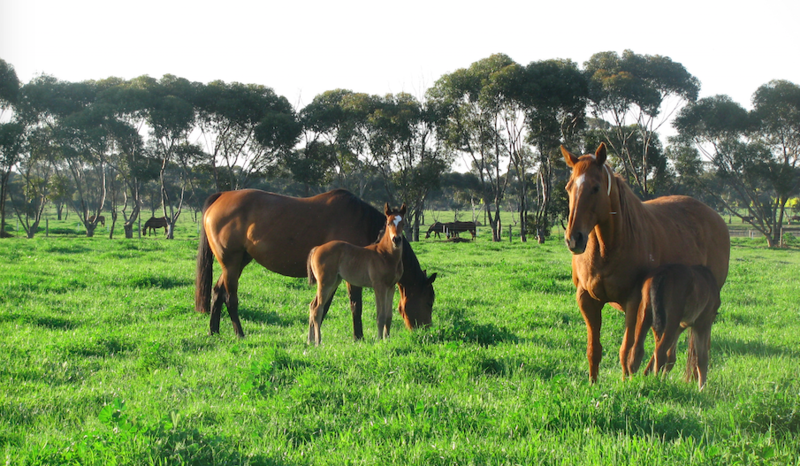 Breeding: The expert team from Victorian Equine Group in Bendigo visit the farm regularly in the breeding season for vetting of your mare and are on-call 24/7. Foaling Down: Every foaling is unique and every mare is different! We provide floodlit foaling down yards and roomy foaling stables. The utmost care is provided pre and post pregnancy with round the clock supervision. Weaning: All foals are handled from birth so when it comes time for weaning it less stressful for them. They are weaned from their mothers in safe and secure stables. They are given a small prep which includes daily handling, halter trained, branded and microchipped. Sales Preparation: Ridgeview Park can provide sales preparation for your weanling, yearling or broodmare to have them looking their utmost to get you the best price in the sale ring! Other Services: Walk-ons to other studs and transport to Vic Sales with our 6 berth horse truck. Hoof trimming. Drenching.